The gap under doors is a sound leak when attempting to create a soundproof room. Applying an Automatic Door Bottom (ADB) is a simple and very effective way to create a strong seal at the bottom of doors. These door bottoms have heavy duty soundproofing and sealing properties that will adapt to your floor condition, ensuring a tight seal against the floor or saddle, even when inevitable shifting and warping of the door occurs. We have a large variety of high quality Automatic Door Bottoms to suit your specific needs. 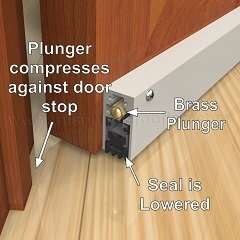 The seal starts off flush with the bottom of the door allowing the door to swing clear without any dragging on the floor. 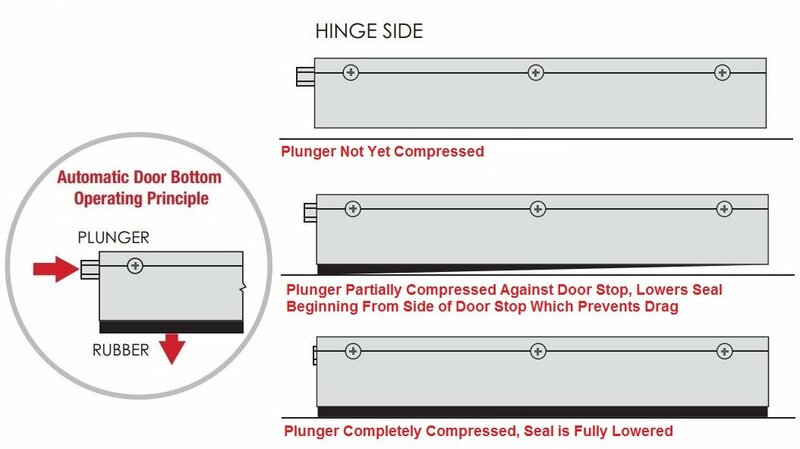 As the door is closed, an adjustable "plunger" is compressed against the door frame, activating a concealed flat spring mechanism. This mechanism drops the seal smoothly from the housing in a scissor-like motion. The door seal compresses tightly against the floor or threshold and retracts automatically when the door is opened. The concealed spring mechanism is activated on the hinge side first, see image below. Once the seal hits the floor on the hinge side it will push down the seal at the other end. This allows the seal to conform to uneven gaps (provided that the gap is in a straight line, not "U" shaped). While our Automatic Door Bottoms seals gaps of .3" - 1" we recommend keeping the gap to 3/8" and not more than 1/2" for optimum performance, see product details for measurements specific to each product. If your gap is larger we recommend installing a threshold or adding some wood furring to the bottom of your door. The brass nut at the head of the ADB can be adjusted in and out to apply more or less pressure on the drop of the seal. This can be adjusted once the ADB is installed onto your door. Click here to view all our Automatic Door Bottoms. 1) Sal: 1. can you cut for size? 2. difference between regular and heavy duty? Trademark Soundproofing Reply: Yes these can be cut to size please email/call us with order. The heavy duty has a wider and thicker seal. Also drops further than the regular. 3) Rebecca R: Do you have something similar to this to use with sliding barn doors? Trademark Soundproofing Reply: Hi Rebecca. Unfortunately we do not.